Just a quick post to let all you artists out there know about an up-and-coming new website from the amazing illustrator Dani Jones — the ArtCast Network. Dani loves to share her extensive illustration technique knowledge via live streaming videocasts on Ustream, and decided there needed to be a website that brought together all the talented atists out there who do live streaming webcasts on Ustream or other similar sites. I have a Ustream cartooning & illustration channel, but I am just getting started. The ArtCast website has inspired me to do much more of this, so keep an eye out for future live video stream where you can watch me sketch & draw live in Adobe Photoshop, and work on cartoon-style vector art illustrations in Adobe Illustrator. And all videos will be recorded and saved to my Ustream channel for those of you who aren’t able to watch live. The ArtCast Network is still in the ‘under construction’ phase right now, but head on over at the link above if you are an artist and want to participate. Just posted over at Design Interviews is an interview with yours truly. Jeff Andrews—the mastermind behind not only Design Interviews but also illustrator group sketch blog Sugar Frosted Goodness among others—was kind enough to ask me to answer some questions and provide some artwork to feature me as one of the artists on the site. Head on over and read up! 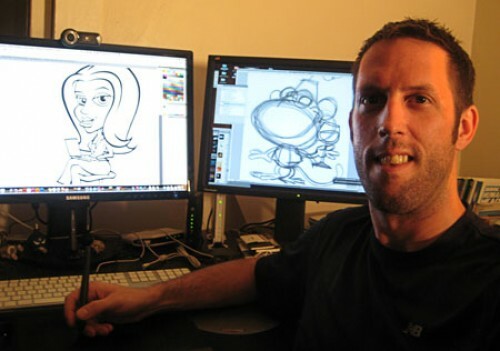 Cartoonist/illustrator George Coghill interview at Design Inspiration. In this video, I am sharing with you a vector path creation technique to speed up the process of creating curved paths by adding intermediate anchor points after your corners have been created. I used to create my anchor points as I was following the curve of the shape I was tracing. Instead, with this technique the anchor points are added to your vector path after your corners have been created, allowing Illustrator to approximate the length of the curve handles for you with much greater accuracy the first time around. Another brief video in my series introducing some great new features in Photoshop CS4 for artists, cartoonists, illustrators and anyone else who sketches or draws using Photoshop. This video features the excellent new keyoard shortcuts that allow you to drag-resize the size of the brushes using the mouse pointer. Cartoonist and illustrator extraordinaire Tom Richmond has an excellent in-depth guide to drawing hands over on his blog. As per usual with Tom’s instructional articles/blog posts, he goes into far more detail and insight than one could possibly imagine he would have time for, even down to supplying illustrated diagrams explaining everything. Many people think the knuckle of the finger rests directly behind the crease that represents the base of the finger right under the bottom finger pad. Now turn your hand around. That main knuckle is SIGNIFICANTLY lower on the hand. In fact it’s below the upper pad of the palm that curve below all the fingers. A lot more of your finger resides inside the palm/body than you might think. Understanding that is a big part of figuring out hands. At some point I can see Tom collating all these posts into a book of some sort. His blog tutorials are better than any book on cartooning I’ve ever seen, and this one is no different. Probably one of the more difficult parts of the human body to draw, and Tom is a master at the cartoon hand. Head over there and learn from the best. Vector artists and Adobe Illustrator users – rejoice! You no longer have to toil away in obscurity. Let the world know where your heart lies. This t-shirt will get a knowing wink from those in-the-know. If you look closely, you’ll notice the heart is in fact created as a vector object, complete with points and handles. Or perhaps these are “love” handles? People may go on and on about the (former) Macromedia Freehand, or their own open-source or alternative vector application, but you know what vector software you love the most. I know, I know. Not everyone is ga-ga over Illustrator. 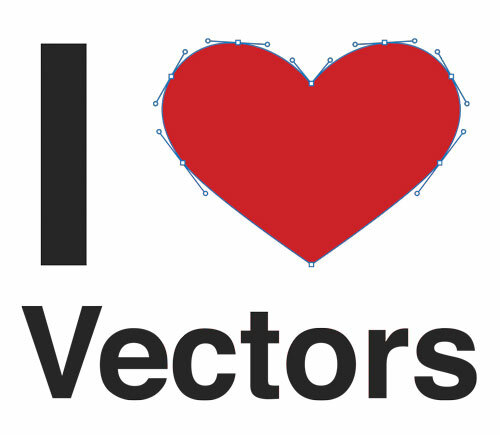 Well, no need to fret — the “I Heart Vectors” t-shirt design is available as well. Regardless of your allegiances, I think we can all agree it’s “Points, Not Pixels”. Are you a vector artist? Have a poster of Pierre Bezier on your studio wall? Do the terms path, handles and direct select get you excited? Well, here’s the t-shirt for you. If you look closely, you’ll notice the heart is in fact created as a vector object, complete with points and handles. Or perhaps these are “love” handles? Whether it’s Adobe Illustrator, the former Macromedia Freehand, or your own open-source or alternative vector application, let ’em know where they can put their pixels. 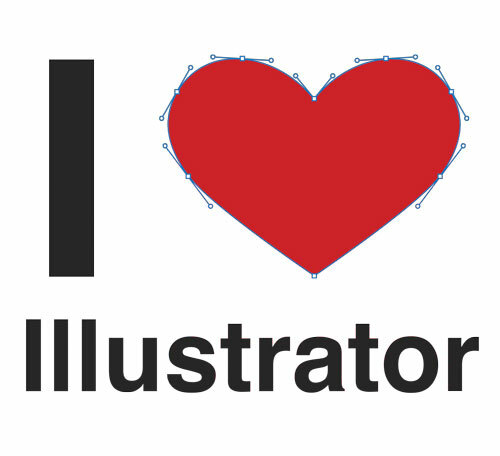 And for you Illustrator-philes out there, check out the “I Heart Illustrator” t-shirt design as well. Yeah, I know – it looks kinda weird. And what is the SmudgeGuard exactly? As you can see from the product shot, it’s kind of a glove – one that only covers the pinky finger and the meaty area of the palm below. Originally designed for artist lefties who were always smudging their work when drawing their palms across their artwork, it’s also useful for any artist working in pencil, charcoal or related media where a hand-drag can smudge the artwork. And, interestingly enough, it’s also quite useful for Wacom graphics tablet users.